Aspengrove is a special mix of serene views, quiet pastures and professional amenities for the equestrian coach, trainer, equine professional, horse club, or riding group looking to rent a facility for their event. Let Aspengrove help make your horse-related event a success! We’ll work with you to put together the perfect experience for your attendees, both human and equine. Visit our Group Rentals page for more information on the many ways we can tailor your equine event. 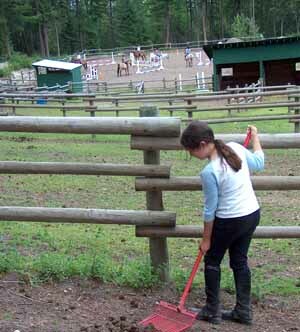 We’ve hosted training clinics, horse-care seminars, coaching retreats and of course our long-running Equestrian Summer Camp program. We’ve got lots of experience dealing with large groups and know how to keep everyone, both horse and human, well-fed and happy. Need a place to layover for a day or two while travelling with your horse? Visit our Bed & Bales page for information. 2 large sand rings (100’ x 200’) with sprinkler systems. One with grandstand. 34 paddocks all with 12 x 12 shelters, automatic waterers & some with trees. 60 acres of post & rail cross-fenced pasture for grazing with 3 heated automatic waterers. 28 x 48 barn with tack room, laundry room, grain room and a classroom/meeting room. Lots of space for truck and trailer parking. Horses enjoy the stay too!